Italians love combining tart and bitter rapini with sweet and savory flavors. Here’s a quick method to prep your rapini. 1. Boil water, add the 1/4 tsp baking soda and vinegar. 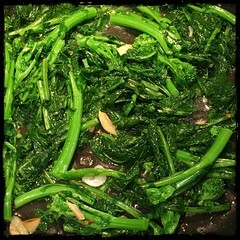 Immerse cut rapini for 2-minutes, remove and toss into ice water, remove and drain. 2. Heat 2 tbsp olive oil in a large pan, add the sliced garlic and optional hot pepper flakes. 3. When the garlic begins to soften (be careful not to burn the garlic, it will turn bitter) add chicken stock, let come to a simmer. 4. When the chicken stock begins to simmer, add some salt and pepper and then add the rapini. 5. cover and let steam for a few minutes. 6. add the freshly squeezed lemon juice, mix well, cover and let cook until the the liquid reduces to about 50%.